Many people remember the joy of receiving their first magic set. However, they probably also remember the frustration of trying to read through vague and difficult instructions that only seemed to complicate their efforts and make the trick look too difficult. By choosing a trick for your child that is age-specific and developmentally appropriate, she will enjoy learning it and feel more confidant performing it for friends and family. This is a simple magic trick that can be performed by children ages 5 and up. The magician rests a pencil horizontally across his left palm. Then, to channel some magnetic energy, he holds his left wrist with his right hand and raises his hand so that its back is toward the audience. Under ordinary circumstances, the pencil would fall; however, the magician appears to have magnetized the pencil and made it stick to his hand. When other people try to make the pencil stick to their hands, the pencil falls to the ground. The secret behind this trick is simple: As the magician raises his left hand, he extends his right index finger to hold the pencil in place. The magician can appear to demagnetize the pencil by retracting his right index finger. This magic trick does not require special preparation or difficult sleight-of-hand. Indeed, after a couple of minutes of practice, your child will be impressing friends and family with this mini miracle. This magic trick is available to purchase at your local magic store and can be performed by children ages 8 and up. The audience sees the young magician give a volunteer three objects: First, the volunteer examines an opaque box and lid; then, she checks out a cube that has a different color on each of its sides. 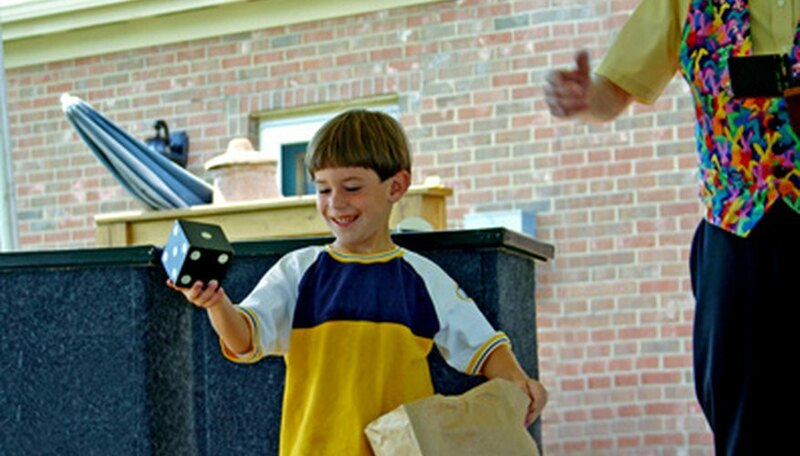 After both objects are found to be normal, the magician asks the volunteer to think of a color on the cube and to seal the cube inside the box with that color facing up. To prevent cheating, the magician places the box behind his back. After a few moments of intense concentration, the magician reveals the chosen color. The secret is that when the box is behind his back, the magician removes the lid and replaces it on one of the box’s sides. When he brings the box into view again, the box will look normal from both the front and the sides. However, the opening in the back of the box allows the magician to catch a glimpse of the chosen color. With this trick, the props are durable and inexpensive, and because the secret move is fairly simple, your child will be able to focus on coming up with a creative presentation. Your child will need minimal practice to perfect the trick and begin performing it. With a little help from an adult, this magic trick can be performed by children ages 4 and up. The magician shows the audience two paper rainbows: One rainbow is red and the other one is blue. When she places red above blue, the blue rainbow is the largest. However, after saying the magic words, the blue rainbow becomes the smallest. For the grand finale, the magician uses her magic to make both rainbows the same size. The secret behind the Jastrow Illusion is that it is an optical illusion: Both rainbows are really the same size. The rainbow on top will always appear smaller; likewise, the rainbow on the bottom will always appear larger. To prepare, print and cut out a template of the Jastrow Illusion (see Resources). After your child colors in the rainbows, cut them out for her. She can make the paper magically shrink and grow by alternating which rainbow is on top. This illusion is easy to perform and requires minimal practice. Based in New York, Evan Paquette has been writing about the arts and education since 2007. His paper on the relationship between creative drama techniques and flow was featured in Kean University's "Educating the Creative Mind Conference Proceedings." Paquette earned a Bachelor of Arts in English and theater from Rutgers University and a Master of Arts in educational theater from New York University.